I refuse to believe this image of the eclipse is real, as much as I wish it were. Not that it couldn't be real. It can. 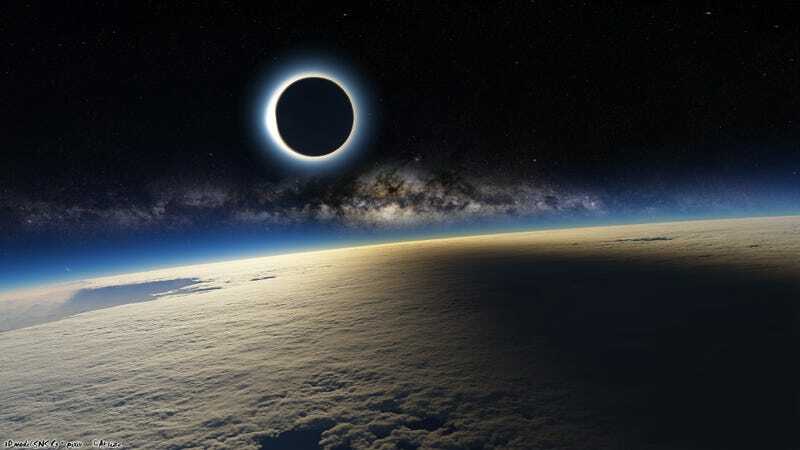 I've seen plenty of photos of eclipses taken from space, but this one is just too awesome to be real. Update: Indeed, it wasn't real, but it isn't a Photoshop. It's a 3D rendering made in Terragen 2 by DevianArt user ~A4size-ska. It took 38 hours to render. The image of the Milky Way was added later in Photoshop. You can get the high resolution original here. It's beautiful anyway. Check out the real image of the Moon shadow, taken by Don Pettit, at the end of this article. The real Moon shadow during Sunday's eclipse, taken by Don Pettit at the ISS.